"Mt. Robson, Spiral Road of Art" by Jane Lytton Gooch, published by Rocky Mountain Books. Features 3 of Jennifer's Landscapes inspired by a hike to Berg Lake atMt. Robson in 2008. The book is available at fine bookstores everywhere. "The 100 year anniversary of Mt. Robson National Park was July 20, 2013! "Mount Robson: Spiral Road of Art" written by Jane Lytton Gooch and published by Rocky Mountain Books celebrates this centennial with over a century of remarkable landscape paintings inspired by the Robson region. It includes an extensive Introduction with historical and cultural background to 50 colour plates in a variety of styles and media from 1907-2012." "SPLASH 14, LIGHT AND COLOR" (April 3, 2012) Jennifer's paintings "Pantheon" and "Teatro" are featured in the hardcover book- It is now available through bookstores or online as of June 2013. "Congratulations to the 106 artists selected for the latest North Light Books’ Best of Watercolor competition, Splash 14: Light and Color! "Southwest Art Magazine" has just announced its finalists for their 2011 Artistic Excellence Competition. Jennifer's painting "Summer Ice" made the Top 40 from almost 3000 International entries. Jennifer's work has been chosen through an international juried competition to be included in "Strokes of Genius 3, The Best of Drawing." The hardcover book is published by Northlight Books in Cincinnati and distributed in Europe, Australia and North America. Three of Jennifer's charcoal and Gouache drawings were chosen, including "Winter's Keep." The book is now available at Amazon, Chapters, and other major book stores. January 2009: Jennifer's work was accepted into Artbuzz, The 2009 Collection, a juried visual arts showcase featuring artists from around the world. Jennifer's work also won their first prize for watercolour. CANADIAN BRUSHSTROKE MAGAZINE 2009 National Landscape Competition prize winner: "Mt Robson, North Face." WATERCOLOUR ARTIST January, 2008: Watercolor Artist has featured Jennifer's painting "Diocletian's Palace" in their "Winner's Circle," a collection of watercolour award winners from across North America. The painting won the A.J. Casson Medal from the Canadian Society of Painters in Water Colour in 2006. THE ARTIST'S MAGAZINE Jennifer's painting "Broken Angel" was chosen from over 1 0,000 entries as a finalist by The Artist's Magazine in their 24th annual competition, and was selected as the cover for their 2008 calendar. SLATE MAGAZINE "Diocletian's Palace" chosen for the CSPWC's ad in Slate Magazine, Oct. 2006. PARKHURST EXCHANGE Profile of Jennifer's work featured in Parkhurst Exchange, a Montreal medical journal. AVENUE MAGAZINE In October, avenue, Edmonton's newest lifestyle magazine, profiled Jennifer in an article by Edmonton writer, Helen Metella. INTERNATIONAL ARTIST MAGAZINE Featured in major article International Artist Magazine ” published in Issue 49, 2006. NEW TRAIL “Spanish Staircase” published in University of Alberta’s New Trail magazine (spring 2004). 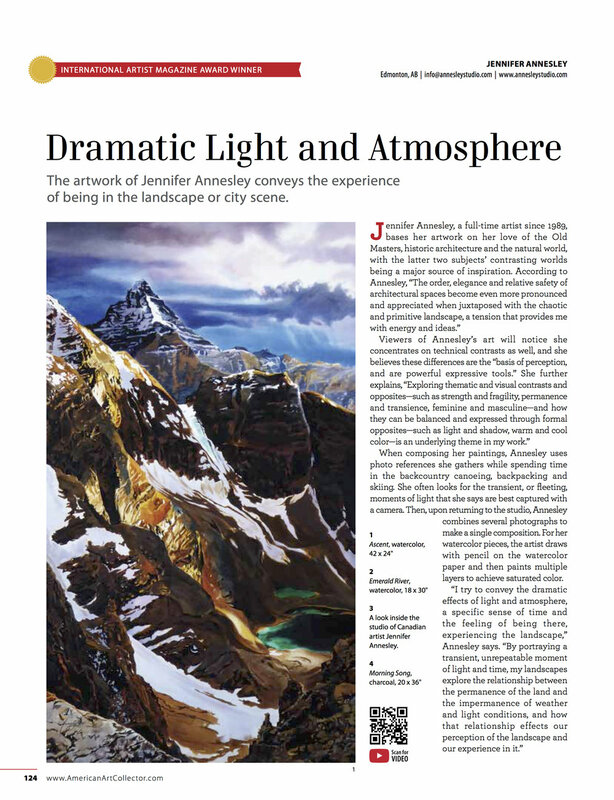 WATERCOLOR MAGAZINE Annesley's work was featured in a major article and on the cover of Watercolor Magazine, winter 2002 edition, a rare honour for a Canadian artist. OTHER VOICES Watercolour painting chosen for the cover of Other Voices literary magazine.